When playing a game of blackjack, hindsight can make us wish we didn’t make a certain move. 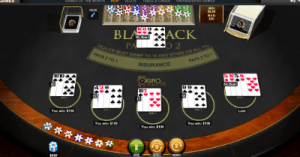 Playtech offers a solution with their variant of 21 known as Blackjack Peek. We take a look at why this rule shake-up prevents the dreaded feeling of making the wrong move in the game of real money blackjack. Blackjack Peek sees a traditional game of 21 with one rule exception – players can peek at the dealer’s face down card. This only applies when the dealer lands an Ace or a card with a value of 10, but when this does happen the dealer checks for blackjack. The player loses if this is the outcome. While this may not sound advantageous to the player, it is as it can prevent players from losing more. For example, if a player has a hand valuing 11 and the dealer has a 10, when the peek rule is in play the dealer’s hand will be checked for blackjack and the game will end if they have 21. Without the peek rule the player is recommended to double if possible and this means doubling their wager. If the dealer ends up having blackjack the player loses more than just their initial bet which they would’ve lost had the rule been in play. This is why playing real money blackjack with the peek rule is recommended. Try Blackjack Peek with multi-hand gameplay. 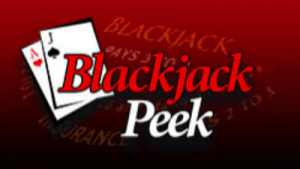 You can find a great variant of Blackjack Peek online at Casino.com by Playtech. The game features six standard decks of 52 cards and multiple hands are eligible to play. The game has an incredibly low house edge of 0.58% – you can get down to 0.13% with the perfect strategy on Microgaming’s Classic Blackjack though – and has standard blackjack rules. In summary, the dealer has to Hit on 16 and Stand on Soft and Hard 17s, Splitting is allowed once, and players can Double after Splitting. Players place their bets by choosing their preferred chips size from as little as 0.01 and as much as 25 and dragging it to the table. This results in a minimum bet of $0.50 to a maximum of $50 – perfect for low rollers. However, players can place wagers on up to five hands meaning high rollers can bet as much as $250 in one sitting. Once the bet is made the player must click the ‘Hit’ button to commence the game. The player will be dealt two cards, both facing upwards, while the dealer will be dealt one card facing down and the other facing upwards. If the card is an Ace or a 10 the hand will be checked for blackjack and the round will end if they have 21. If it is an Ace, players will also be able to take the Insurance side bet before the dealer checks for blackjack. If blackjack isn’t revealed, gameplay will continue and players will be able to Hit, Stand, or Double Down. Blackjack pays 2:1 here which is better than a 3:2 payout – and another reason as to why we love this blackjack variant. Blackjack Peek also offers the 10-Card Charlie rule where you automatically win if you draw 10 cards without going bust. It’s very unlikely but it’s a fun addition to have. You know a software provider cares more about their players than making a profit when they include the function where a window will appear asking if you’re sure you want to Hit when you have a certain hand. For example, if you have a hand valuing 18 and you accidentally click ‘Hit’ instead of ‘Stand’ a box appears to ask if you really want to make this move. You can turn this function off by clicking the box – but we advise against it. Playtech titles also come with the unique feature of being customisable. There’s 10 different table colours available for players to choose from to change gameplay up. This goes hand in hand with the exceptional graphics offered by the top software provider and the smooth gameplay. Playing the basic strategy is important when it comes to all real money blackjack variants, including Blackjack Peek. The basic strategy is a chart which offers the best possible move to make, according to statistics, in relation to the total of your two cards and the dealer’s up card. It isn’t 100% guaranteed to give you a win every time, but it will lower the house edge on blackjack games and give you a better chance at winning. Combine this with the fact you’re removing the chance of betting extra when the dealer could have blackjack on Blackjack Peek means the odds may just be in your favour. Look up the chart – with six decks in play and the dealer Stands on all 17s – via Google when playing Playtech’s variant and keep it open in a separate tab. There’s no time limit on making a bet with the online casino game so you can take your time learning the best move when playing the peek variant. International players can play real money Blackjack Peek at Casino.com where you can also find a huge range of blackjack games offering great rule variants.